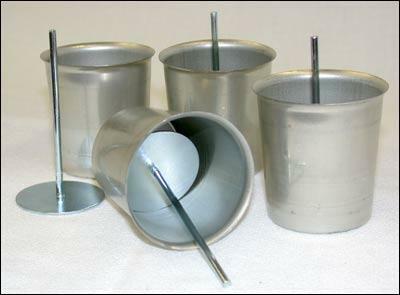 We stock a full line of candle making equipment, accessories and supplies to help candle maker's, large and small. Below, you will find all you will need from candle making thermometers, melting and pouring pots, candle dipping vats, tea light containers in aluminum as well as plastic, votive cups and molds for square and round candles, tart molds, rubber candle plugs and more. Candle Making Thermometer (Glass Type) - This economical glass thermometer has a metal scale completely enclosed in glass with easy-to-read numerals and graduations. It is equipped with a 9 mercury tube & convenient pan clip. Dipping Vat - 4" x 15" or 6" x 15"
This seamless aluminum melting pot-pouring pitcher is safe from leakage, easy to pour from and has the capacity for holding approximately 4 pounds of melted wax or melt-n-pour glycerin soap. Easier to use than Coffee Cans. Made of sturdy, easy-to-clean aluminum with heat resistant plastic handle. 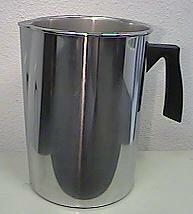 This seamless aluminum melting pot-pouring pitcher is similar to the standard four pound size. It will hold approximately 1 pound of melted wax or melt-n-pour glycerin soap. Melting pot-pouring pitcher is 5 high and 4½ in diameter. 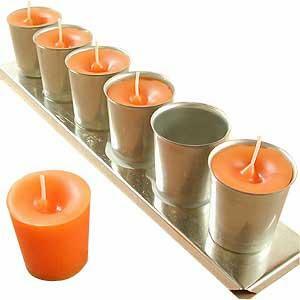 It is ideal for pouring tea lights and votives when only a small quantity of melted wax is needed. 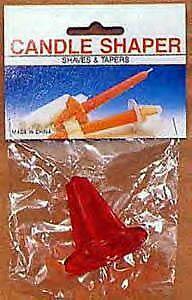 simply attach wick to each end and dip jig in tank full of dipping wax. 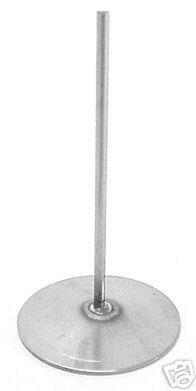 Adjustable for different sizes of dipped candles from 1 inch to 13 inches. 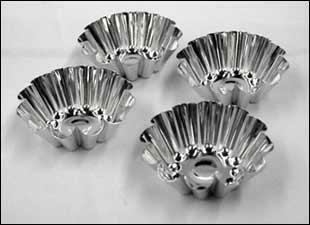 Now you can make your own Potpourri or Tea Light Candles with these aluminum containers (1½ diam. x ¾ deep). 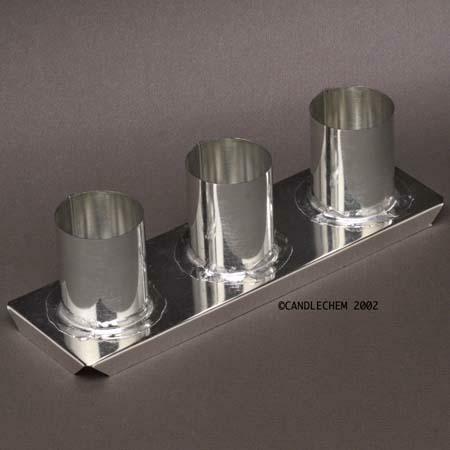 Please refer to Bulk/Wholesale price list for great price on 1000 Tea Light Aluminum Containers. These plastic tea light cups are made from a non-combustible plastic polycarbonate material. The cup will not deteriorate from the heat of a candle. Same size as aluminum cups, but more rigid. Does not include wicking or wick tabs. This 6-cavity votive mold strip consists of six standard size seamless votive molds welded to a metal strip for easy handling. Standard votive mold is 1¾ in diameter at top, 1½ in diameter at bottom and is 2 high. Molds are flared at top. This mold will produce the finest votive candles, which will fit into all popular votive containers. The finished candles may be used as room scenters, food warmers and patio lights. 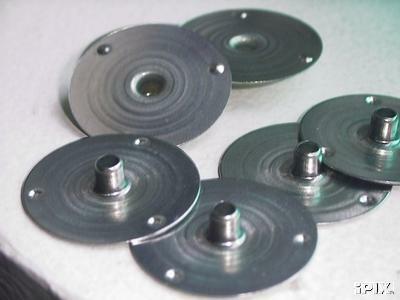 These molds are made from heavy seamless metal and taper from top to bottom. Top is 1¾, bottom 1½, height 2. This taper insures easy removal of finished candle from mold. Slightly flared at top. Our votive wick pins fit perfectly into our standard 2 oz votive molds. Just place the wick pin in the votive mold, pour your wax and let set up. When the votive comes out of the mold, simply push the wick pin out and replace with your tabbed wick. These wick pins save a tremendous amount of time and effort and as an added bonus, the wicks are always perfectly aligned. 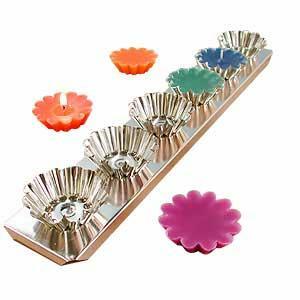 A set of 12 - 2 oz standard size seamless metal votive molds with 12 votive wick pins. 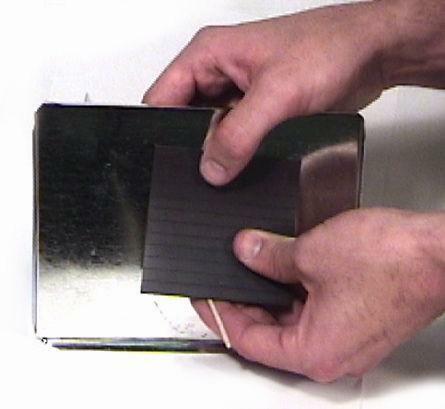 Six seamless tin plate floater molds welded to a metal strip for easy handling. The individual molds measure ¾ deep, 2¼ across top and 13/8 across the bottom. 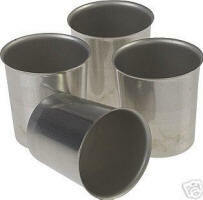 Three tin plate round votive molds welded to a metal strip for easy handling. 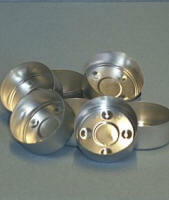 Each round votive mold cup is 1-9/16 in diameter by 2 high. 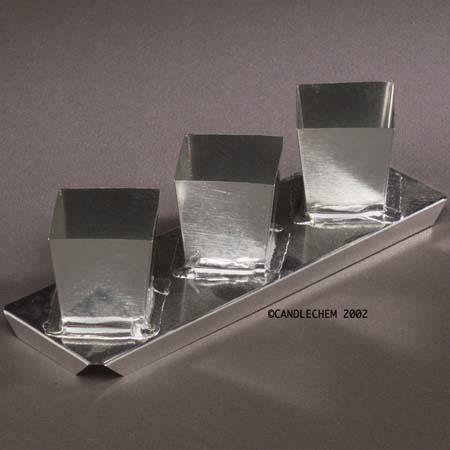 Three tin plate square votive molds welded to a metal strip for easy handling. Each square tapered votive mold is 1¾ by 1¾ by 2 tall. These molds are used to make wax tarts, chunks or scent samplers. 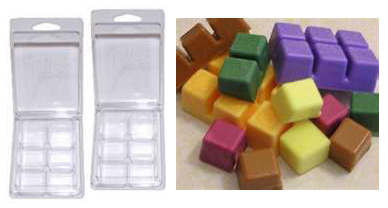 These molds are made of crystal-clear resilient PVC plastic and can accommodate high fragrance loads and pour temps up to 175 degrees F. Can also be used to make scented soap cubes. Each clamshell unit will hold 5-1/2 ounces of wax (for all 6 melts) and each cube produced is 1-1/2 X 1-1/2 X 1 inch in diameter. 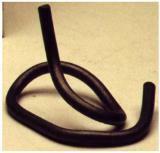 A flexible one foot length of ¼ diameter lead. Used to "weight" metal molds in water bath. Simply wrap the length of lead around the base of the mold. Candles made in this mold can be used to float on water as in a centerpiece, party favors or as wax embedments in larger candles. 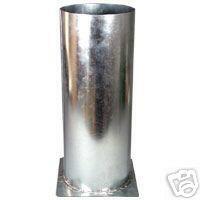 The molds are seamless and made from heavy gauge tin plate with scalloped edges. They measure ¾" deep, 2¼" across top & 13/8" across the bottom. Also available in 3-cup and 6-cup strips. 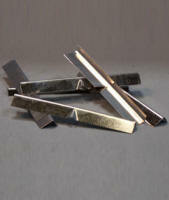 These round wick tabs are used to secure wick to bottom of containers or votives. Has been the industry standard for years. It is 15mm in diameter, about the size of dime, with a 3-mm neck. Approximately 1100 tabs per pound. These round wick tabs are used to secure wick to bottom of medium to large size container candles. Can also be used for pillar candles and votive candles. It is 20mm in diameter, about the size of a nickel, with a 3-mm neck. Approximately 660 wick tabs per pound. These magnetic mold sealers are a lifesaver for the candle maker. Simply thread wick tip through wick hole leaving approximately ½ exposed. Bend this end so that it lies flat and attach magnetic mold sealer making sure the wick is not exposed. Apply pressure to ensure a good seal. Be sure to watch your wax temperature. Wax that is poured too hot may loosen seal. Wipe clean after each use. Available in packs of 6 pieces. These 3/4" wide metal wick bars can be used to hold wick in place in jars as well as candle molds. Available in 4", 5", 6" and 7" lengths and packaged in lots of 6. 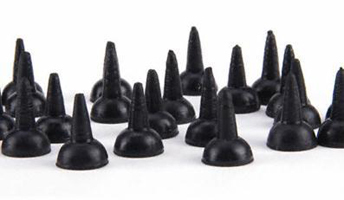 These are tapered rubber plugs used to seal the bottom of aluminum and tin-plate metal candle molds. Just fasten wick to top of mold with craft stick or suitable wick bar; pull tight at base and push & twist small end of rubber plug into hole to prevent wax from leaking out of wick hole.